This is one of my favourite “local” destination when I am back in Melbourne. I have been there a few times and I have been building a list of top things to do in Broken Hill. It’s not only about the town. There is so much more than that. Silverton is surely a place I would not miss to see once in the area. But let’s proceed with order. Broken Hill is probably one of the biggest towns in the outback. It is located in New South Wales however it is extremely close to both South Australia and the Victoria borders. One of the best tips I can give straight away ….don’t take any fruit or vegetable with you. Broken Hill is in the Fruit Fly Free Zone. This means that when you approach the town there are bins where you have to leave all of your fruit and vegetables. If you do not do that you may be fined, up to $10,000. And police checks are not unheard of. This is a real pity, especially if you arrive from Victoria and Mildura, one of the best area in Australia for fresh fruit. You can drive through the fields and buy directly from the producer. Usually, they leave fresh products in a small cabin with the price. It’s up to your honesty to leave the money in a box. Of course a must. Broken Hill is a mining town really far from all the major cities. It is in New South Wales however it is 1,100km from the state capital, Sydney. It’s actually closer to Melbourne, only 850km , and even more to Adelaide, 500km. My first experience in Broken Hill was almost 10 years ago when I decided to drive from Sydney to Broken Hill to spend there the New Year Eve. What was the reason for the trip? The road from Sydney to Broken Hill goes through the Blue Mountains National Park and Dubbo. It was quite easy to get it right 10 years ago and even more now with the smartphones. I drove to Broken Hill from Melbourne few times and the road can be quite interesting with few things to do and see on the way, from the famous gold era towns to some of the best wineries and orchard we have in Victoria. Either way, the last 250km to Broken Hill are in the desert with nothing else than you, your car, few emus and kangaroos, and lots of goats. You may meet other cars, but you can count them almost on the fingers of your hands! I like to think Broken Hill as the capital of the outback, a town with the desert all around for hundreds, if not thousands, of km. If you like the idea to explore this kind of environment you definitely have to plan your trip to Broken Hill. This is what I call the real Australia, the real Australians, the real Aussie style. Melbourne and Sydney are both beautiful in their own, there are plenty of attractions in these cities, however, they could both easily located in Europe or US. The outback is instead an Aussie thing, something you can’t experience somewhere else. You may think that the desert can be a fantastic experience for the first few hours but than it can get slightly boring. Not quite in Broken Hill and around. These are the top things to do when in the area. Based on which season you go it can all be different. I like to start my visit to the town from the top. This is a hill overlooking the town with a spectacular view to the street grid and the outback in the foreground. It gives a good idea of the Broken Hill size. There is a small open air museum with some old mining machine and a restaurant with a visitor center and a Miner’s Memorial (for the over 800 victims of mining accidents). The access to this viewpoint is only open during the day, which is a pity because I always wanted to do some photos in the night from there. This is a must visit for any trip to the area, I believe it is the top attraction of the town. Broken Hill is world famous for his mining industry and you can’t leave the town without at least visiting one mine. The Daydream mine is around 20km north of Broken Hill, direction Silverton, therefore plan your trip including both. As they say, to avoid disappointment book your trip in advance. I got disappointed because I had to go there twice as the first time I did not book and the tours were full. Have a check to the history of the mine and organise your own trip. I like to remind, for your time planning, that the last few km to the mine are on an unsealed road. It is only 5-10km after the Daydream mine. Combine both in a morning or afternoon trip. I loved the feeling of this small village. It seems to be suddenly in an outback movie or on the set of Mad Max. Ehi but it is indeed the area where Mad Max I was filmed! There is a Mad Max museum, which I highly suggest for the fans of the trilogy. You can’t miss it with some of the movie cars parked in front of the shed. Silverton is becoming more popular with artists that reside here far away from the hustle and bustle of the city. There are a few galleries where you can buy a nice memory from the outback. I went there by car twice and once by bicycle. Silverton is the end station. The sealed road terminates there. If you are into cycling it’s actually a great ride to do, about 30km from Broken Hill. The advantage of riding, versus driving, is that the wild animals don’t get scared of the noise and you can experience the real desert life. Obviously, this pub is in the village. I decided to keep it outside the village description because this hotel would be a good reason by itself to justify a trip there. I had many friends visiting Melbourne, Sydney, Brisbane etc and sometime they tell me that they can’t find really any huge difference between the Aussie pubs and the European/English pubs. The main reason is that the cities are now so cosmopolitan. I always tell them to go in the outback and they won’t be disappointed. The Silverton Hotel is a must visit. It’s a typical Aussie pub, what you would expect from a local hotel! I suggest a visit to this area towards the end of the day. I experienced here one of the most beautiful sunset in my life, just superb. Arrive a couple of hours before sunset to visit the Flora and Fauna Sanctuary, a man made area of 180 hectares that give an insight to the local plants. There is a one and half km trail that takes you though a cultural and aboriginal flora and fauna adventure experience. The area is delimited by an electric predator-proof fence. Once the time comes for the sunset go to the top of the hill where 12 sculptures, from local and foreign artists, will be illuminated by a beautiful range of warm colours from the sun that will progressively hide on the horizon line. Pro Hart is one of the most famous Aussie artist, and for a good reason, his work is majestic and in many different styles. I like to compare Pro Hart artistic life to Leonardo Da Vinci. This is because Pro Hart, as Leonardo Da Vinci, used to experience with a different medium. In the gallery you will find his work as a painter, as a sculptor, using different materials too, and as an artisan. The gallery is well organised with a multi level art exhibition. What is going to impress the visitors the most? The selection of painted Rolls Royce at the main gate, yes he loved cars too. I was not born in Australia and as a child, I still remember watching a documentary/film where there was a school that had a class with a teacher using a radio to communicate with the pupils hundreds of km away. Being born in Europe I found it a bit “different“. This is the School of the Air. It’s a real school to allow the children in the stations spread around the outback to have a normal education. If you are unfamiliar with the concept I really suggest a visit. They have organised tours that take you through the school and allow you to participate to a lesson as a listener. Before the internet, the lessons were made using radio transmission. Nowadays the internet is the way. Some of the stations do not have a cable connection and they use satellite internet. Another interesting concept is that even Australian children living overseas can actually take this school. I assisted to a lesson with children based in small villages in Malaysia and Indonesia. This is another mandatory stop if you like to have more of an understanding of how life in the outback works. I rode my bicycle through the outback for over 2,000km and I can assure you that distances are enormous. Sometime I would meet just 15-20 cars in a day. Other times the only people I would speak were at the stations, which are 80-150km away from each other. If something happens then forget the ambulance and that is where the Royal Flying Doctor service comes in. This is a lookout on the hill opposite the Broken Earth Complex, on the other side of Broken Hill, where the water treatment station is. Check the map below for the exact location as Google map gives a place slightly different, 200m away. This is another remarkable pub/hotel to visit. And you can actually sleep there too. The entrance is unique to say the list with paintings from wall to ceiling that makes you feeling in an Aussie style Sistina Chapel. Really really interesting! The painter is an indigenous artist from Port Augusta, Gordon Waye. There is also a pub section with live music on the weekend. Again very Aussie style with a long table you will end up sharing with some of the locals or tourists visiting the area. One of the most known Aussie movie, Priscilla Queen of the Desert, was actually filmed in the pub and around Broken Hill. This is the weekend destination from Broken Hill, especially in the dry/hot season. If you decide to venture there have first a check at the information Center to see if the road is open, it may be closed in the raining season. I was there in the super hot season. I actually cycled there from Broken Hill and, believe it or not, I met 2 other cyclists on my way, that’s kind of unbelievable considering I crossed maybe 5 cars!! The trip of 110 km is an experience by itself. I met kangaroos, emus that got so closed to me to be almost scared. When I was there the lake was extremely dry to a point that I could hardly see any water at all. It’s unbelievable to think that in the raining season the water can actually overboard the lake boundaries! It was interesting to see all of the wild animals in the lake bed. As I usually say, the beauty of the outback is that you can’t get bored, every single season makes drastic changes to the landscape. The Menindee Lakes area is another sign of the change in the Australia geography. If you made it to Menindee than extend your trip to the Kinchega National Park. The roads are only unsealed however, at least in the dry season, this is not a problem even if you don’t have a 4WD. The top attraction in the park is the old Kinchega Woolshed. I had really an interesting time there, definitely few things to see. I was not really aware of the shearing process and I have now more of an understanding. There is almost a sort of museum. However just walking in the woolshed is an experience by itself, especially if you think that in the heydays there were over 6 million sheep in the area which is now a real desert! That gives again an idea of how the outback is changing, unfortunately towards a dramatic dryness. The woodshed in the Kinchega National Park built almost 150 years ago. If you drive from Victoria have a stop at this memorial tree. Maree Kester was a teacher and motorcycle enthusiast from Broken Hill, who died from breast cancer in 2010. This is another place that should remind us how important is to donate to cancer related associations. It also reminds us how essential is to use an high protection factor cream in Australia where the sun is way too strong for any skin. In one of the occasion I was there I took my road bicycle with me. I had a great experience in the outback which I would definitely suggest to anybody. Cycling takes you to experience the desert at a slow speed, with animals that don’t run away, scared by the engine noise. You will be able to smell the desert as well, something impossible otherwise. ….and finally, let’s leave the heroes for the TV programs. In real life, without cameras and help, in case of radical problems, it’s always better to go back to the station you started from and try again the day after. I usually stay at the Royal Exchange Hotel. It’s a lovely old Aussie style hotel/pub right in the middle of the city. It’s probably the most convenient accommodation, considering location, price and quality. I always feel like in the gold era when I step in. I can only suggest it. One of unique things of the outback are the trains. Very informative, thank you. I have never been to Broken Hill and plan to travel from Sydney by train in April with my partner and thought we would stay for about 7 to 10 days, hiring a car while there. b) are there scenic flights available? Hi Glenn. It does definitely work. However, do not discount to drive there, instead of the train. I did the same from Sydney a few years back and I still remember the unique trip, especially the last 200/300 km in the middle of the desert. About the scenic flight, try to contact Silver City Scenic Flights on their Facebook page. 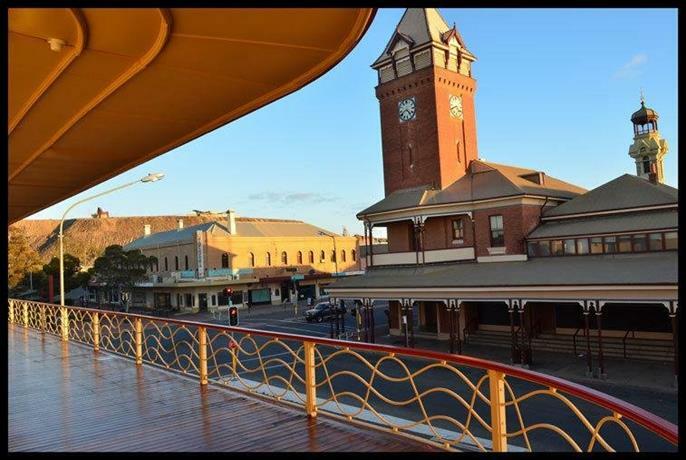 Today, Broken Hill is booming heritage town in the far west of New South Wales. Stay a couple of days and explore the city and its surroundings before heading off to Silverton, Corner Country, Menindee Lakes and the Darling River. The beauty of the outback landscapes, the magic of colors, glowing sunsets and deep blue skies, have attracted artists, photographers, and travelers, to stay in this major center in New South Wales’ far west. Stopped in through your twitter link Stefano, and this must have been such an incredible experience to ride the Outback on your bicycle. A very descriptive, fascinating and enticing post. It makes me want to go there myself. Thank you for sharing! Cheers Carl, the outback is a great experience by itself, whatever way you do it. Running there must be also a great experience. Although you need really to take care about the animals around. I once crossed a long snake and avoid it just in time. What I love the most is that you have a sense of smell that you can’t experience in the car. You can also hear things that you would not otherwise, unrecognisable noises too.